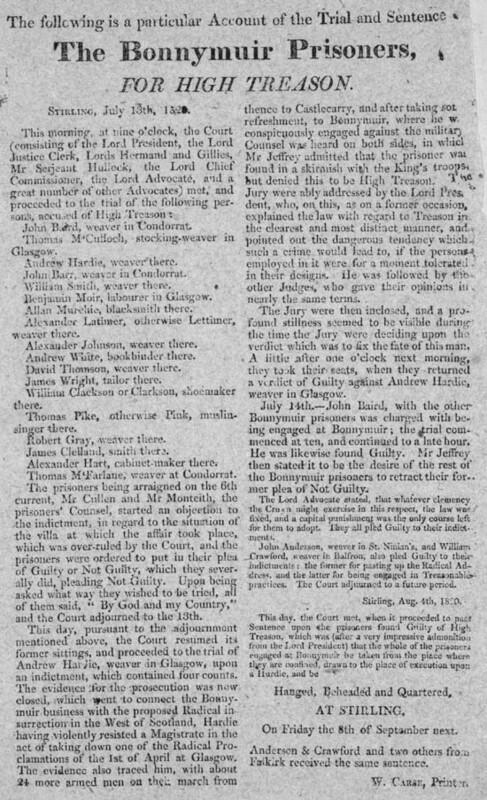 This court report begins: 'This morning, at nine o'clock, the Court (consisting of the Lord President, the Lord Justice Clerk, Lords Hermand and Gillies, Mr Searjeant Hullock, the Lord Chief Commissioner, the Lord Advocate, and a great number of other Advocates) met, and proceeded to the trial of the following persons, accused of High Treason . . . ' Dated July 13th, 1820, the sheet was published by W. Carse, Printer. The formidable assembly of top legal minds listed in the introduction to this sheet illustrates what a sensitive and important case it was. 'The Bonnymuir Prisoners' were in fact political prisoners, as they were Radicals who had started demanding some political rights. However, since the decade following the Battle of Waterloo is generally regarded as the era when Britain came closest to undergoing a political revolution, the Establishment had to be very careful as to how this state trial in Stirling was conducted. The ringleaders, Andrew Hardie and John Baird, plus four others, were found guilty of treason, and were executed at Stirling in September, 1820.